Increase visibility across project activities, prioritise your work, get it done. 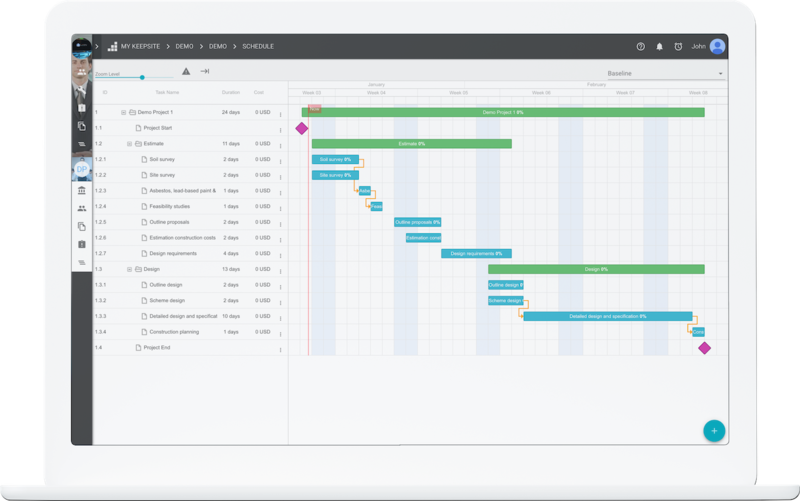 Keepsite enables you and your team to plan your work and manage the project schedule. In fact, with Keepsite, you can even see all your schedules in a single portfolio view. Keepsite's scheduling tool has all the essentials - dependency relationships, critical path, baselining, resource and progress tracking. Configure Keepsite consistent with your organisations risk strategy. Identify, log, and manage risk on each project and at every level of the business. Control threats and realise opportunities as they arise. Keepsite takes risk management beyond a niche specialisation and enables consistent, collaborative, and inclusive risk management. It gives organisations full visibility of their total exposure across the portfolio, and most importantly, the power to act.